Update: Clear Channel Withdraws Application . . . No Electronic LED Billboard on Rt. 252! I have received notification from Finbar McEvoy, President of Daylesford Lake Condominium Association that Clear Channel has withdrawn their application for the Radbill Park residential to commercial re-zoning change. The billboard on Rt. 252 will not be changed to an electronic LED billboard. I was unable to attend last week’s Planning Commission meeting where the discussion centered around a zoning request to change Radbill Park from residential to commercial zoning. The request was driven by Clear Channel who would like to have the traditional Rt. 252 billboard changed to an LED electronic billboard. Many people have asked what happened at the Planning Commission meeting and I am to provide the following meeting summary, authored by Finbar McEvoy, president of Daylesford Lake Condominium Association. Here’s a link to the summary. The Pennsylvania Resource Council completed a study, Signs, Billboards & Your Community which provides interesting research on this subject. To read the study, click here. Approximately forty Tredyffrin residents including a large number from Daylesford Lake attended the regular meeting of the Tredyffrin Township Planning Commission. The meeting started with a presentation by Clear Channel Outdoor, Inc. on the benefits to the community of installing a digital LED billboard on the site of the billboard that currently sits on Rte. 252 across from the entrance to Daylesford Lake. Barbara Bridge, Vice President for Public Relations at Clear Channel, made the presentation. She said the new sign would have the capability to provide instant “Amber Alerts”, information about the FBI’s most wanted fugitives as well as news from the Township. She put the number of time slots that would be available for Township advertising at one hundred per day. There was a great deal of discussion by the Commission members concerning the brightness of the new billboard and how much light would extend from it to nearby homes. Clear Channel claimed there would be minimal impact. However, they were unable to provide quantitative data, including light output levels and changing brightness over time, to support their arguments. Clear Channel acknowledged that the images on the display would change as frequently as every eight seconds. In addition they stated that the Billboard would be lit twenty four hours per day, although that schedule could be modified. 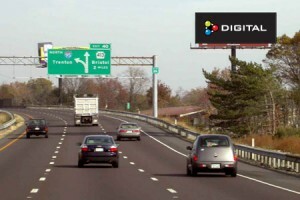 In response to a point made by a Commission member, that the Federal government prohibits moving images on billboards in order to reduce distractions to drivers and nearby residents, Clear Channel contended that studies which they have reviewed support the conclusion that LED billboards do not increase the number of accidents. That finding was echoed by Township Manager Mimi Gleeson who reported that she had asked the Police Department about the impact of the sign on traffic safety. In responses to questions from Commission members about power failures, Clear Channel stated that auxiliary power (a back-up generator) could be added to the billboard in the future and it would be possible to install a two-sided display if the Township asked to modify the lease. Clear Channel also said it was unaware of a similar type of billboard in a residential area within ten miles of the proposed site although they thought there is an LED billboard in Easttown Township. Members of the Planning Commission asked more questions after Clear Channel’s presentation. These focused mainly on the precedent that would be set by the Commission’s decision since this would be the first billboard of this type located in the township. Some Commission members expressed the opinion that an LED billboard would be a good way to get Township messages to residents. They stated that the Township had difficulty doing that in the past. Other Commission members expressed concern about the placement of the sign in a residential area and the impact it would have on the residents who live nearby. One member asked if the sign could be switched off at night when traffic volumes were low. Clear Channel answered, “anything is possible”. After Commission members completed their questioning, the floor was opened for public input. Scott MacNair from the law firm of Clemons, Richter and Reiss (www.clemmonslaw.com) spoke first. Scott was representing Daylesford Lake Condominium Association. He expressed concern about the size of the proposed billboard and its close proximity to the busy intersection at Bear Hill Road (Rte 252) and Howellville Road. He noted that the intersection has been the site of accidents and the proposal to have the sign face southbound traffic would make it an increased distraction to drivers. He presented the Commission with several studies done in other states that support the conclusion that billboards do increase the level of distraction for drivers. Scott also reinforced another speaker’s point that a brighter and frequently changing sign should not be located in a residential area. He said it is much more appropriate on a major highway like Interstate 95 or Route 422. Finally, Scott expressed doubts about the small amount of “light spillage” that Clear Channel claimed would impact local residents. John DiBuonaventuro, the Township supervisor who represents Daylesford Lake and Daylesford Estates, then reinforced the importance and seriousness of the issue by urging the Planning Commission to refer it to the Township Traffic Committee. Then four residents from Daylesford Lake including two who are directly impacted by the existing billboard behind their units spoke to the Commission. Julia Barns who lives at Unit #4 stated that the existing billboard shines into her deck and living room and that during the nearly twenty years she has lived in Daylesford Lake the brightness of the sign has increased. She questioned whether any of the Clear Channel executives have an LED billboard in their backyards. Bill Goulding whose unit is directly across from the billboard (within 50 yards) expressed his concern about being able to sleep with a picture that would change every five minutes or less. He made an analogy to trying to sleep with the television on. “You can see the picture changing even if the lights are off and your eyes are closed.” Finbar McEvoy, President of the Daylesford Lake Condominium Association, stated that the existing billboard can be seen from several locations in the development and the proposed LED billboard would fundamentally alter the character of the community. He also stated that over one hundred and twenty residents of Daylesford Lake have signed a petition expressing their opposition to the proposed change. Following the public input, members of the Commission discussed how they should vote on the issue. One member wanted to deny the application on the basis that the sign does not belong in a residential area. Others wanted to take a neutral position. Another point of view was that the information provided was not sufficient to render any decision. Several members wanted to refer the matter to the Traffic Committee. One member expressed concern about the contents and transparency of the Township’s lease agreement with Clear Channel. He strongly advocated including language that would prevent any administrative change to the lease without a public hearing and public input. The Commission decided to ask Clear Channel to provide additional information about the Billboard and to answer the questions raised in this meeting. Then they referred the matter to the Traffic Committee for review and additional input. The Commission will make its final recommendation after the Traffic Committee makes its report. The Traffic Committee (http://www.tredyffrin.org/boards/tc/) will meet on Wednesday November 17. The Planning Commission’s (http://www.tredyffrin.org/boards/pc/) next meeting will be on Thursday November 18. Because the Planning Commission is an advisory body, the Board of Supervisors will make the final decision. The Board of Supervisors could take up the issue as early as Monday, December 6th, the date of its next meeting. While the Planning Commission members seemed uncertain about their role in the decision making process for rezoning Radbill Park and which course of action they should take, they did seem to understand the importance of the precedent that their decision would have for the Township. There appeared to be a lot of uncertainty about the impact of the LED Billboard on residential areas. The Township’s need for new sources of revenue and improved communications with its residents were recurring themes. It was also revealed that rezoning is required for this situation because PennDOT regulations do not allow for LED signs on state roads in residential-zoned areas. Bear Hill Rd. (Rte. 252) is a state road. The Commission must also consider how the proposed change fits into the Township’s development plan. The Commission acknowledged the importance of the public’s strong reaction to the proposal. Local residents will be meeting to assess the situation and to plan for subsequent activities. Further updates will be provided as those plans becomes available. Does Tredyffrin Township Really Need an Electronic LED Billboard . . . Why? Everyone has seen them. Quite frankly, it’s impossible to miss them. While focus has been on driver distractions of cell phone usage and texting, another driver distraction has been emerging . . . electronic billboards! With this new technology, motorists are drawn visually to a large screen color and light show, much like a TV on a stick. Electronic billboards (EBB) typically are seen along major highways and turnpikes. But that may soon be changing in Tredyffrin Township if a change in zoning is permitted. Presentation by Clear Channel Outdoor Inc for proposed ordinance and zoning map change for Radbill Park: ORDINANCE AMENDING SECTION 208-8 OF THE TREDYFFRIN TOWNSHIP ZONING ORDINANCE, AS AMENDED, AND THE ZONING MAP OF TREDYFFRIN TOWNSHIP BY RECLASSIFYING A PROPERTY ON THE EASTERN SIDE OF ROUTE 252, SOUTH OF HOWELLVILLE ROAD AND WEST OF THE PENNSYLVANIA RAILROAD TRENTON BRANCH FROM THE PRESENT R-1 RESIDENCE DISTRICT CLASSIFICATION TO THE C-1 COMMERCIAL ZONING DISTRICT. The proposal is to change the current R-1 (residential) zoning of the Radbill Park billboard location to C-1 (commercial) zoning. Under present R-1 zoning the traditional billboard cannot be changed to an EBB. To erect an EBB, requires C-1 zoning. You might wonder why Clear Channel and the township would want an electronic billboard and there’s an easy explanation . . . money. Under the present 6-year contract with Clear Channel (which is due to expire shortly) the lease agreement is approximately $29K per year to the township. However, with multiple advertisers on an electronic billboard, the lease agreement would include higher rental revenue to Clear Channel and to Tredyffrin Township. Significant increase in revenue . . . not sure, but certainly more than $29K per year. So why should we care if the township rezones the Radbill Park billboard location from R-1 to C-1 to permit EBB? After all, we know that it will increase township revenue and in today’s economy, that would seem to be a good idea. In my opinion, there are a number of good reasons not to permit the billboard change. I have several concerns in regards to changing the zoning to C-1 to permit EBBs . . . first, I believe that an EBB at Radbill Park will cause ‘quality of life’ issues for residents of Daylesford Lakes and Daylesford Estates. (I have been told by a number of residents that at night the lights of the current billboard sign are intrusive, I can only imagine how invasive an electronically lit billboard streaming in to their homes, 24-7 would be) . Secondly, I believe that electronic LED billboards belong on major highways or the turnpike not in a residential setting. However, my biggest concern in regards to EBBs is the safety issue. A 2009 report, by ergonomics consultant Jerry Wachtel, developed for the American Association of State Highway and Transportation officials, confirms three issues about electronic billboards — (1) EBBs attract eyes away from the road for extended, unsafe periods of time (2) signs should not be placed near interchanges or where drivers face challenging conditions, and (3) the youngest and oldest drivers face higher driver safety risks with regard to EBBs. It is important to review reason #2 in the report . . . challenging conditions. If you live in Daylesford Lake and you exit to Route 252, the proposed EBB is directly in front of you. Already dangerous for exiting Daylesford Lake residents (particularly if crossing Route 252 south lanes to go north on Route 252), they will now have to contend with drivers distracted by the proposed electronic billboard. If there was ever a prescription for an accident, this could be the one. I thought it would be interesting to look at how other parts of the country are coping with the new movement of electronic billboard advertising. In the spring, Denver banned EBBs, citing safety concerns. St. Louis passed a one-year moratorium. Michigan and Minnesota are holding hearings to impose a two-year moratorium and four states ban billboards completely. One EBB can utilize the equivalent electricity in one year of 52 homes, so “When every stretch of highway in America looks like Times Square, it will be too late to worry about the driver distractions caused by electronic billboards,” said the Philadelphia Inquirer in “Roadside Distractions” on March 22. Unlike a cell phone, a person cannot choose to turn them off. Do we think that additional revenue from an electronic LED billboard out-weighs quality of life and safety issues? Would love to hear an opinion on electronic billboards from the two State House 157 Representative candidates.